The proper equipment in conjunction with the proper knowledge can make the difference between an awesome wilderness experience and a full blown epic. 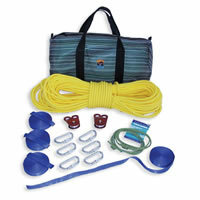 A Rescue Wrap Kit and a Comprehensive Medical Kit are the foundations to proper river safety equipment. What we can't sell you is the knowledge and the experience to use these items in a confident and effective way - we highly recommend participating in classes and researching rescue topics. The Clavey Rescue Wrap Kit has everything you need to effect the lions share of possible river rescues including the Z-Drag.